The shutdown is forcing scientists to cancel presentations and halt research. As the partial federal government shutdown enters its fourth week — on January 12 becoming the longest in U.S. history — scientists are increasingly feeling the impact. Thousands of federal workers who handle food safety and public health are furloughed. Countless projects researching everything from climate change to pest control to hurricane prediction are on hold. Among government agencies hit by the partial shutdown are the U.S. Geological Survey, the Department of Agriculture, the National Oceanic and Atmospheric Administration, the Environmental Protection Agency and NASA, where nearly all employees are on leave. Additionally, 40 percent of the Food and Drug Administration’s 14,000 workers are furloughed, as are most employees of the National Parks Service and the Fish and Wildlife Service. Meanwhile, the National Science Foundation, responsible for doling out nearly $8 billion in research funds each year, has stopped awarding grants and has canceled review panels with outside scientists that are part of the process. In 2018, NSF gave out $42 million in grants from January 1 through January 8, but this year, nothing has been funded so far, Benjamin Corb of the American Society for Biochemistry and Molecular Biology noted in a statement January 8. Such stalled funding is leading to a backlog that could slow down approvals long beyond the shutdown. Here are some of the consequences of delaying government research, and how some scientists are trying to cope. Both the National Institutes of Health and the Centers for Disease Control and Prevention remain funded and operational. Flu surveillance is still being funded through the CDC. Medicare and Medicaid insurance programs are also safe. But other agencies working to protect public health have scaled back operations. The Indian Health Service, which funds care for Native Americans, is in limbo. Health clinic employees are working without pay, while some grants and programs are on hold. The USDA is still inspecting meat, dairy and poultry products. But routine FDA inspections of produce are suspended, increasing the possibility of a foodborne illness outbreak. Given that worry, the agency hopes to resume inspections of high-risk facilities prone to outbreaks, FDA commissioner Scott Gottlieb told the Washington Post. Weather forecasts have become less accurate, with the National Weather Service’s key prediction tool not working correctly and no one around to fix it, the Washington Post also reported, citing Suru Saha of the National Weather Service’s Environmental Modeling Center in College Park, Md. Meanwhile, work to improve hurricane models by adding the latest in physics and data isn’t happening, forecaster Eric Blake at the National Weather Service’s National Hurricane Center in Miami told Scientific American. EPA employees policing industry compliance with laws restricting air and water pollution are on leave, and work to clean up Superfund sites, areas of extreme environmental contamination, is suspended. That means any research into the potential health or environmental effects of new contaminants is on hold. National parks are also in disarray, with few rangers to control crowds or enforce sanitation rules or regulations against environmental damage. Visitors wanting to drive off-road through the California desert cut down protected Joshua trees to clear a path in Joshua Tree National Park, park superintendent David Smith told National Parks Traveler. It can take years for desert soils and slow-growing Joshua trees to recover from such damage. Scientists aren’t able to gather data from government websites that are not being updated or are now offline. That’s hurt climate scientist Angeline Pendergrass’ work building computer models at the National Center for Atmospheric Research in Boulder, Colorado, to predict how climate change will impact rainfall patterns. Pendergrass normally verifies her calculations against precipitation records housed in the Global Historical Climatology Network, which logs global temperature and rainfall measurements. But while those data are still being collected automatically, the data aren’t available as usual through NOAA. Pendergrass’ project was stalled for days until she found a workaround to access the data in a different way. “I worry a lot about missing observations” from monitoring equipment malfunctions, Pendergrass says, which could mess up her research. Her concerns are well-founded. About 10 percent of contributing U.S. weather stations appear to be offline, lead scientist Robert Rohde at Berkeley Earth, an independent group for scientific analysis based in Berkeley, Calif., tweeted. And data from “a large number of foreign stations are also not being merged into the archive,” he wrote. Animals in USDA facilities are still being cared for, but scientists can’t collect data or do experiments. Interruptions in animal research involving steps being taken at certain times — like cows that need to be bred at a certain age — can set researchers back months or even years. During the shutdown, federal scientists can’t attend scientific meetings — important arenas for sharing new research. Already, government scientists have missed key conferences on astronomy, biology, weather and agricultural science. More than 10 percent of planned participants at the American Astronomical Society meeting that just wrapped up on January 10 in Seattle had to cancel presentations, AAS spokesman Rick Fienberg says. Some were able to ask coauthors to take their place; astrophysicist Jane Rigby at NASA’s Goddard Space Flight Center was not one of them. Hundreds of USDA employees have also pulled out of the San Diego meeting of the International Plant & Animal Genome that starts January 12, says conference co-organizer Alison Van Eenennaam, an agricultural genomicist at the University of California, Davis. One of Van Eenennaam’s graduate students relies on a USDA computer server to run a simulation program for research that’s needed to complete her degree. She isn’t allowed to access it right now, so the planned updates to make the program more suitable to the project’s needs also aren’t happening. “She’s stuck,” Van Eenennaam says. Some scientists can ride out any funding delays. But for those working on projects that are time sensitive, the halt in funding approvals threatens to throw off an entire year of work. Physiologist Hannah Carey is still waiting for this year’s money to come in for her research at the University of Wisconsin–Madison on ground squirrel hibernation. Because hibernating animals endure extreme changes in body temperature and heart rate, studying how they cope could help scientists understand how human bodies deal with trauma or extreme conditions. James McClintock has made 15 journeys to Antarctica. Looking through a three-foot-wide dive hole into the frigid blue waters of Antarctica, James McClintock saw something he’d never witnessed before. A passing shrimp-like amphipod appeared to be carrying a tiny orange pack on its back. Intrigued, McClintock, then a young assistant professor of polar and marine biology at the University of Alabama at Birmingham, scooped up the creature and took it back to the lab at McMurdo Station where he and a fish biologist teased the pack from the creature’s back. To their stunned surprise, the orange pack opened up and flew away. The tiny sea butterfly, which had been captured and held by the amphipod, turned out to contain an unpalatable chemical that kept the crustacean from becoming lunch for some hungry fish. Its discovery not only landed McClintock in the pages of the prestigious journal Nature but also launched a career that has made him a something of scientific rock star. McClintock (biology, ’78, Cowell) has published 265 scientific papers, written two books, spoken about his work in front of 1,000 people at a Moth storytelling event at Lincoln Center in New York City, and had a point in McMurdo Sound in Antarctica named after him by the U.S. Board of Geographic Names in honor of his work. More importantly, his research in Antarctica has included studies on ocean acidification, the effects of climate change on marine life, and the discovery of chemicals contained in seaweed and sponges that may hold promise for treatment of melanoma and the deadly MRSA bacterium that is resistant to many antibiotics. If not for two professors at UC Santa Cruz, his story might have been very different. Arriving at the wooded campus from Santa Barbara with the idea of studying English, McClintock remembers becoming intrigued when a Cowell College core course in biology turned to talk of marine invertebrates. He soon signed up for an invertebrate zoology course taught by John Pearse and Todd Newberry, now both emeritus professors in the department of ecology and evolutionary biology, which focused on these amazing and adaptable creatures. Pearse, for his part, recommended that McClintock spend a semester at a UC marine research lab in Bodega Bay studying sea stars and sea urchins. But if Pearse grabbed McClintock’s soul, Antarctica took his heart. He’s been there 15 times as a researcher and 10 times as lead lecturer for an annual philanthropic cruise focused on climate change organized by the ship line, Abercrombie and Kent. Listen to him talk by phone from his campus office in Birmingham and his description of Antarctica is close to poetic. “The scale of the landscape is absolutely stunning,” he says. Mountain ranges that appear close enough to touch are actually hundreds of miles away. The sea surface, glassy and calm one minute, can be lifted into the air by hurricane-force winds a few moments later, while the ice is alive with unimaginable shades of blue and green. “You don’t come back from Antarctica the same way you left,” he says. His research trips, the last 25 years of which have been funded with grants from the National Science Foundation, have included a collaboration with Bill Baker, a marine natural products chemist from the University of South Florida, and Charles Amsler, a seaweed biologist also from the University of Alabama at Birmingham. Working out of remote Palmer Station, the trio has focused on defense mechanisms developed by invertebrates and seaweed involving chemicals that are unpalatable and sometimes toxic to their predators. The research also has had implications for drug development including the discovery of a substance in sea squirts that appears to fight melanoma and a seaweed protein that seems to be active against the H1N1 flu, which sparked a 2009 pandemic. Most recently, the group found a compound in an Antarctic sponge that could help in the treatment of a specific type of the deadly MRSA bacteria. Meanwhile, McClintock, along with his colleague Richard Aronson at the Florida Institute of Technology, is also charting the movement of king crabs up the Antarctic Slope as ocean temperatures rise. The arrival of these claw-equipped predators on the Antarctic Shelf could cause incredible damage to a pristine sea floor where rare invertebrates like sponges and anemones thrive, he says. But if the excitement of discovery is what brings McClintock back to Antarctica, it is the rapid changes he’s witnessed there makes him worry for our future. He’s studied the impacts of ocean acidification and watched a glacier that used to calve once a week now release chunks of ice four to five times a day, he says. The seabirds, he explains, lay their eggs the same week each year but because of climate change, unseasonable snowstorms sometimes bury the colony and when the snow melts, the penguin eggs and chicks drown. That’s one of the reasons, he says, he has shepherded 200 well-heeled cruise-ship passengers to the Antarctic each year for the past decade. Experiencing a beach filled with a mass of penguins that have no fear of humans and will often wander up to inspect their two-legged visitors, seeing humpbacks surface, and hearing scientists talk about how climate change is threatening the breathtaking landscape and wildlife can bring people to tears, he says. “These people go home as ambassadors for Antarctica. They talk to senators and politicians about climate change,” McClintock says. That outreach has made him understand the importance of scientists letting their voices be heard. He helped start a website, UAB in Antarctica, which allows lay people an up-close look at scientific research; has traveled across the country speaking to students from third grade to college, and has lectured in front of groups including the famed Explorers Club. In fact, he says, since the United States pulled out of the Paris Accord, which laid out a plan to reduce greenhouse gas emissions, his requests for climate-change talks have increased. Yet, his message, he says, is also hopeful. He likes to tell the story of the discovery of the ozone hole over Antarctica in the 1980s, when scientists released a paper detailing how the protective layer between earth and the sun was thinning. “What I like to tell people is that within several years of one of the most important papers of the 20th century,” McClintock says, “we had 20 countries sitting around a table in Montreal and they OK’d the Montreal Protocol” which phased out products that were harmful to the ozone layer. The treaty has now been ratified by 197 parties. Last year, McClintock says, a new paper showed that rather than expanding, the ozone hole is shrinking. The University of California, Santa Cruz, opened in 1965 and grew, one college at a time, to its current (2008-09) enrollment of more than 16,000 students. Undergraduates pursue more than 60 majors supervised by divisional deans of humanities, physical & biological sciences, social sciences, and arts. Graduate students work toward graduate certificates, master’s degrees, or doctoral degrees in more than 30 academic fields under the supervision of the divisional and graduate deans. The dean of the Jack Baskin School of Engineering oversees the campus’s undergraduate and graduate engineering programs. UCSC is the home base for the Lick Observatory. Astronomers are expanding the search for extraterrestrial intelligence into a new realm with detectors tuned to infrared light at UC’s Lick Observatory. A new instrument, called NIROSETI, will soon scour the sky for messages from other worlds. 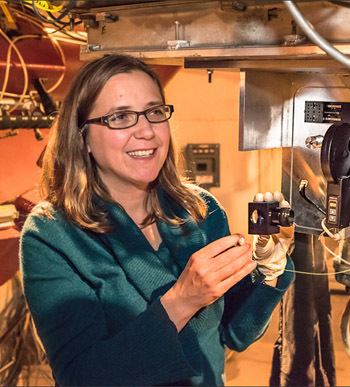 “Infrared light would be an excellent means of interstellar communication,” said Shelley Wright, an assistant professor of physics at UC San Diego who led the development of the new instrument while at the University of Toronto’s Dunlap Institute for Astronomy & Astrophysics. Wright worked on an earlier SETI project at Lick Observatory as a UC Santa Cruz undergraduate, when she built an optical instrument designed by UC Berkeley researchers. The infrared project takes advantage of new technology not available for that first optical search. Infrared light would be a good way for extraterrestrials to get our attention here on Earth, since pulses from a powerful infrared laser could outshine a star, if only for a billionth of a second. Interstellar gas and dust is almost transparent to near infrared, so these signals can be seen from great distances. It also takes less energy to send information using infrared signals than with visible light. Frank Drake, professor emeritus of astronomy and astrophysics at UC Santa Cruz and director emeritus of the SETI Institute, said there are several additional advantages to a search in the infrared realm. “The signals are so strong that we only need a small telescope to receive them. Smaller telescopes can offer more observational time, and that is good because we need to search many stars for a chance of success,” said Drake. Scientists have searched the skies for radio signals for more than 50 years and expanded their search into the optical realm more than a decade ago. The idea of searching in the infrared is not a new one, but instruments capable of capturing pulses of infrared light only recently became available. Now that technology has caught up, the search will extend to stars thousands of light years away, rather than just hundreds. NIROSETI, or Near-Infrared Optical Search for Extraterrestrial Intelligence, could also uncover new information about the physical universe. NIROSETI will also gather more information than previous optical detectors by recording levels of light over time so that patterns can be analyzed for potential signs of other civilizations. 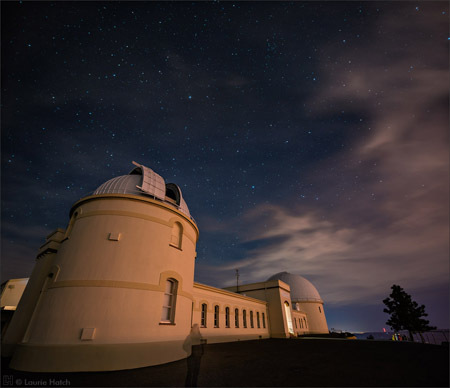 NIROSETI will be fully operational by early summer and will scan the skies several times a week on the Nickel 1-meter telescope at Lick Observatory, located on Mt. Hamilton east of San Jose. The NIROSETI team also includes Geoffrey Marcy and Andrew Siemion from UC Berkeley; Patrick Dorval, a Dunlap undergraduate, and Elliot Meyer, a Dunlap graduate student; and Richard Treffers of Starman Systems. Funding for the project comes from the generous support of Bill and Susan Bloomfield.